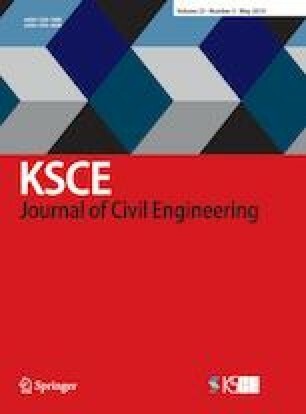 In this study, a remodeling index (RMI) prediction model was developed to determine and prioritize target sections for large-scale repair works of deteriorated expressway concrete pavements in Korea. The unit sections that represent the distribution of the structural condition of entire analyzed sections were selected for jointed concrete pavement (JCP) and continuously reinforced concrete pavement (CRCP), and the RMI of the representative sections was rated by a panel of members. The model that predicts the RMI of aging JCP and CRCP after a few years hereafter was developed using the RMI obtained by the panel rating as a dependent variable, and the pavement conditions, pavement age, traffic volume, and weather conditions of the corresponding sections were considered as independent variables. The RMI sensitivity was analyzed according to each independent variable, and the appropriateness of the RMI prediction model was verified by comparing the RMIs in 2016 predicted in 2014 (future RMI in two years) with those in 2016 predicted in 2016 (present RMI). The entire aging expressway concrete-pavement sections were divided into homogeneous sections of suitable lengths for remodeling works by applying the RMI prediction model to each unit section. The priority for remodeling works was determined among the highly ranked homogeneous sections using the predicted RMI. The actual pavement conditions of a target section in which the remodeling priority had the highest rank were verified.